Back in the well-chronicled day, it was common for the Topps Chewing Gum Company to take photographs of baseball players in spring training, usually by camping outside Peoria’s only Sizzler steakhouse. If said professionals were traded before their cards were released, Topps would simply break out the acrylics and airbrush a new logo on the cap. Only trained professionals with jeweler’s loupes could tell the difference. 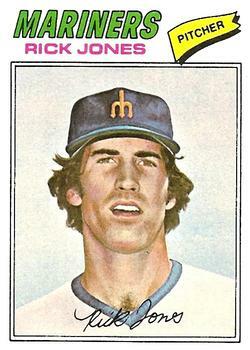 Drunk with power, the Topps executives decided to take this even further, by creating Rick Jones. The plan was simple: using state-of-the-art Apple II computing technology, the company was able to create an amalgam of every single ballplayer in history. They conjured up random statistics, including a solid 2.11 ERA at Winston-Salem. They then slapped on a cascading waterfall of brown hair, a touch of neck-high chest hair for added virility, and as the piece-de-resistance, they added him to the Mariners roster. Most regions of the country were not yet aware that Seattle even had a baseball team, much less who actually played for the team, and so the addition went unnoticed. The faux-Blyleven wisely vanished, but Rick Jones got greedy and tried to pitch one last game. He worked three innings before a guilty Topps middle manager, horrified by the growing spectacle, finally contacted the team. Manager Darrell Johnson ran out onto the field during warm-ups and tackled Jones. Seattle fans, still unused to the sport of baseball, cheered politely. The pitcher disappeared; rumors abounded that minority owner Danny Kaye arranged to have him buried underneath the pitcher’s mound to lift the city’s ancient curse. This proved false, however, when the team brought him back to start two games in the 1978 season. There really wasn’t anyone better in the Mariner farm system. After that, the player known as Rick Jones really did disappear once and for all, taking with him the team’s collection of rare jewels. Danny Kaye left baseball a broken, sad old man. The curse, sadly, was never lifted. We hoped you liked reading Rick Jones, Tragic Experiment Gone Awry by Patrick Dubuque! It looks like he is wearing two hats.